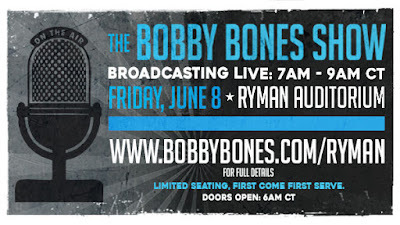 Bobby Bones Show to Broadcast Live from the Ryman during #CMAFest! 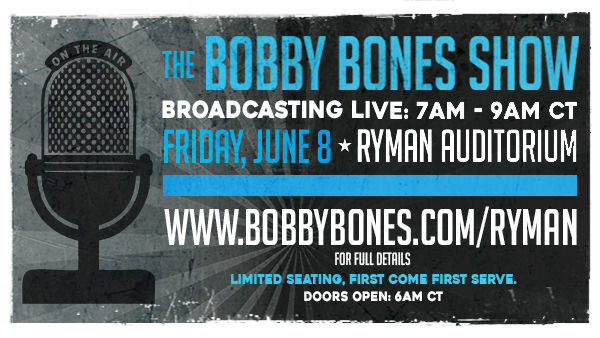 The Bobby Bones Show is moving out of the studio for the inaugural The Bobby Bones Show, Live From the Ryman Friday, on June 8th. Bobby is inviting fans to join in for a live broadcast of his award-winning morning show at Nashville’s historic Ryman Auditorium during CMA Fest. Appearances by Chris Janson, Kassi Ashton, American Idol 2018 Winner Maddie Poppe and runner-up Caleb Lee Hutchinson. The live broadcast begins at 7:00 am CT on Friday, June 8th (doors at 6:00 am). Seating is limited and available on a first come, first served basis. The Bobby Bones Show Live from the Ryman!